So before we talk about what a GoPro stabilizer mount actually is, let’s start with what a GoPro is? A GoPro is the market leader when it comes to action cameras. And for good reason too. GoPros have the potential to take amazing videos, they’re designed to be attached to cars, helmets, surfboards and much more. This is due to their small size. However, some people have noticed that GoPros can be slightly shaky when taking part in action sports or if sudden movements are made. However, there is a simple solution to this common problem. Which is, as you’ve probably guessed by now, a GoPro stabilizer mount! So without further delay, we will now list the top 10 stabilizer mounts for GoPro you can get. Also if you enjoyed this post you might also like our post on the 10 best waterproof cameras you can get. This GoPro stabilizer by Opteka will fit most compact cameras and camcorders. It offers amazing value for money and fits comfortably when you’re holding it. It comes in many different colors such as: black, blue, orange, red and green. The product comes with a 1-year warranty and the shoe mount is removable. Also, the Cushioned NBR padded handle will alleviate stress when taking part in long filming sessions. One customer purchased this product for a vacation he was taking. He says the product works really well both in and out of the water. He also says that the quality is surprisingly good considering the price. Another customer says that there is actually a noticeable difference in the footage when comparing holding the camera by hand to holding the camera with the stabilizer. Another customer says the GoPro Stabilizer mount does exactly what it is meant to do. The customer says that it is lightweight and makes certain shots a breeze. Another customer uses the mount for skateboarding. He says it works perfectly, especially since it’s very easy to hold and its lightweight. If you want something slightly more professional and don’t mind spending the extra money to get it then maybe you should get GoPro’s official Karma grip. The Karma grip will give you amazing cinema quality video, and it’s compatible with most go pro mounts. It will make your ordinary shots look extraordinary. It is compatible with the Hero5 and the Hero4 )you need the camera specific karma harness for the Hero4). The battery life will only last you 1 hour 45 minutes, however, on the plus side, a carrying case is included. One customer says that this product offers great stabilization, and she also likes the fact that she can power the camera and the stabilizer at by only pressing one button. Another customer says that the stabilizer works great and is easy to use. However, this customer did not like the battery life of the product. Also, he points out that the battery is not replaceable, so if something happens to it you’re pretty much stuck with it. One customer said that this stabilized mount works really well considering its price. He says that when shopping for stabilizers, this was the most price friendly. At first, he was concerned about the quality, then once he started using it he realized that the quality is actually really good. Another customer says that this stabilizer mount is a must-have for recording events, as it is powerful, robust and lightweight. This customer was very satisfied with the results of this stabilizer mount. Another customer really likes this product as the customer says it is large and comfortable to hold. This customer also states that it works just as well as stabilizer mounts that cost twice as much. This go pro stabilizer mount is a versatile piece of equipment. It has a built-in smartphone camera clamp. It is designed well and has rubber grips which not only make it easier to hold but add extra protection for your device. It is compatible with most GoPros and has a portable design. This means that you can carry it around on almost every occasion. One customer says that this is an awesome little grip. The customer states that the grip works well with his Sony camcorder. The customer will be certainly using it for their next trip. Another customer states that if you love to shoot video then this GoPro stabilizer mount is a must-have. He says the difference between using it and not using it is very apparent. He also says that the product is very well made and doesn’t feel flimsy like other products out there. Another customer says this product was exactly what she needed for her very small video camera. She says her husband can now handle the camera with ease. She also says it was very easy to attach the product. Another great product by Fantaseal. This GoPro Stabilizer mount works for many different products and brands such as Nikon/Canon/Sony/GoPro/SJCAM/Xiaomi Yi/Sony/Garmin Virb XE/ iPhone/Samsung and the list goes on. This product is unique because it offers low shooting angles. The removable mini ball head can also be used to attach flashes, video lights, LED lights or even microphones in a number of different positions. This product is great for different action sports such as motor racing, biking, surfing, skiing, or rollerblading. Another customer says this product is simple to use and can hold two devices simultaneously. This customer says he plans to use it with his phone for regular recording. The Feiyu Tech FY WG wearable gimbal is a very portable device. It is compatible with most GoPro’s. The product offers a one year warranty. 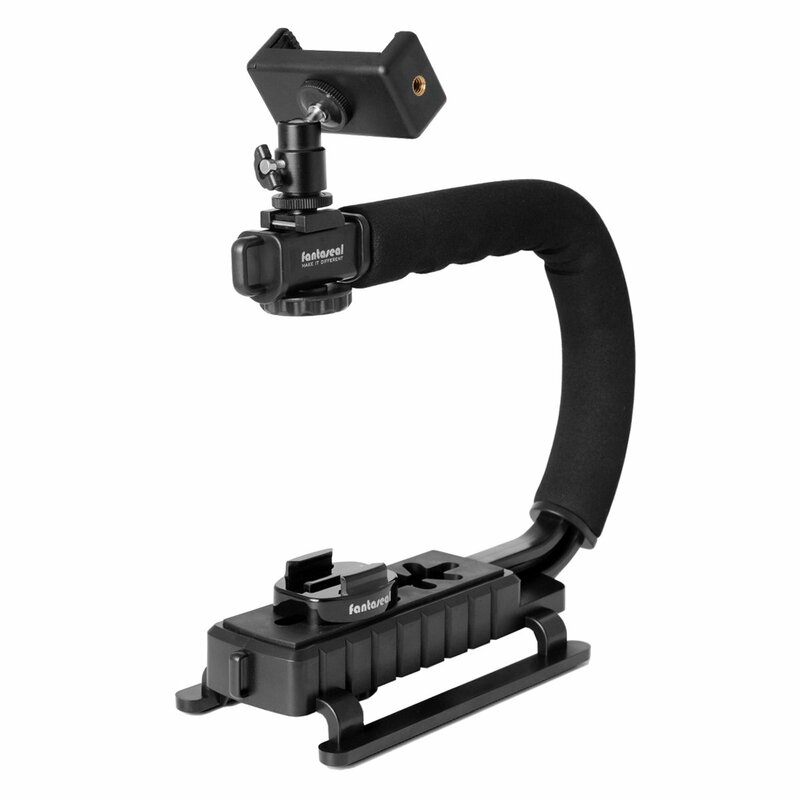 The gimbal can be attached to different orientations and tripod screw mount accessories such as selfie sticks, bikes, helmets and other accessories. Offering you smooth video from any aspect. One customer says this product works okay unless you are running. This customer also says that the software updates on this device can be very confusing. It took this customer, hours of trial and error and youtube videos to figure them out. Another customer says this is a great product overall, however, the customer thought it should have come with a battery charger. The customer says the gimbal is very smooth, has 4 modes, and is fairly simple to use. Another customer says the gimbal itself works well however, it makes a high pitch noise when running, and this noise is audible in the video. The customer says the noise is irritating and would preferably buy something else in the future. 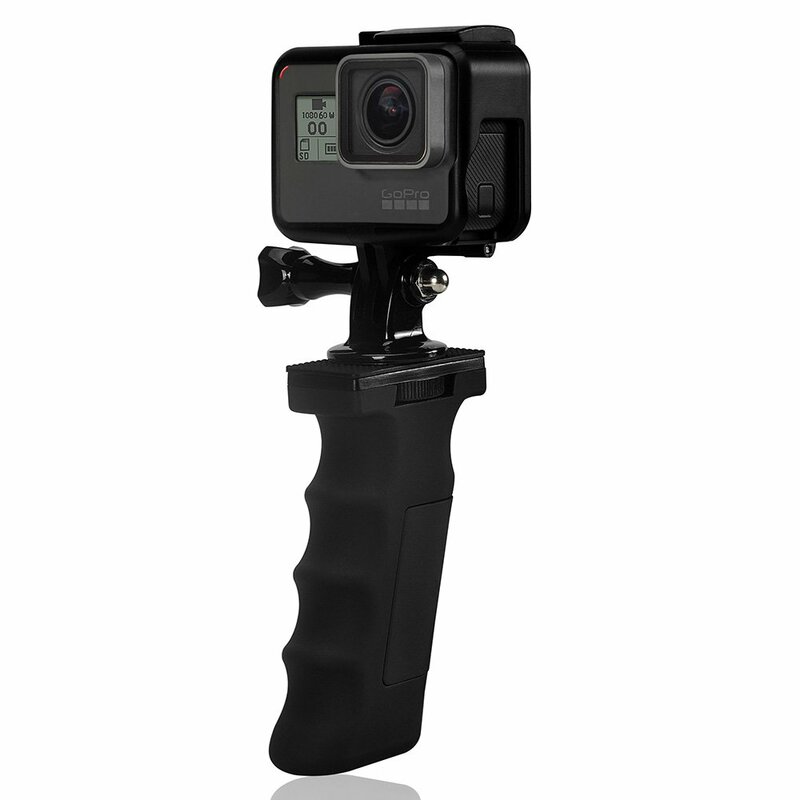 This product is designed specifically for GoPro products – such as the Hero 3, Hero 4 and the Hero 2. This product can help you with producing high quality, shake free videos. The frame of this GoPro stabilizer mount is built with durable material which gives you that extra piece of mind. This may come as surprising considering how lightweight the product is weighing under 0.5lbs. One customer said no matter how much he tried, he couldn’t get it to balance with the GoPro 5. He says other than that the device works well with other devices. Another customer says this is an outstanding product if you read the instructions first. The quick start guide tells you how to balance it and how to add weights. When the customer tried it without reading the quick start guide he has some trouble. Another customer also states that this is a great product. However, you do need to read the instructions before simply jumping in. This product by CamKix is a versatile hand grip. It can be used in many different ways and it is also really good for selfies since you are able to use the hand grip as a selfie stick. With the hand grip, you also get a firm grip so you can take stable shots that come out great every time. The product comes with a tripod adapter, a universal phone holder, a large thumb screw, a cleaning cloth and of course the hand grip. Another customer says that this product was easy to assemble. He uses this product with an iPhone and the customer states that he feels very secure with his phone attached due to the strong grip. Another customer says this product was perfect for her needs. She says she was looking for an inexpensive grip as she gets tired from holding her phone for long periods of time, and she says this product simply does the job. This waterproof GoPro stabilizer mount is another great product for filmmakers. The stabilizer is sturdy and allows you to produce action shots that take those hard to reach angles. The grip is textured which further gives you that sturdiness. You will be sure that it will not slip out of your hands. The product is also very portable, the handgrip is pocket sized. One customer says that this product is of great quality. You really get a premium feel from this product, considering the price this is pretty impressive. Another customer says this is a ‘five-star’ product. He says the product works well, has a great grip, and overall he has no issues with it. Another customer says that it looks slightly cheap when you first take the product out of the box. However, it works great and has given the customer no issues. This product is made of high-quality material. It is not made of cheap plastic like some of the other products out there. The grip provides a comfortable hold that is slip resistant. This GoPro stabilizer mount is also compatible with most other action cameras. You are even offered a 12-month warranty with this product to give you that additional peace of mind. One customer says that this product really does have a solid grip. He says it is very easy to install, especially with the built-in thumb screw. Another customer says that this product is surprisingly effective. the customer says that the product is very comfortable to hold. The customer also says the product has a soft velvet feeling. Another customer says he is very satisfied with this product. It fits her GoPro Hero 3 perfectly. She says that the swivel feature makes it very easy to rotate the camera. The only thing she would say is missing from this product is a wrist strap, just-in-case, she drops it.